The number of international students in France continues to grow, but at a slower pace than has been the case for other major study destinations. The end result is that, even as the total number of foreign students in the country continues to increase, France is effectively ceding market share to other leading countries that are growing more quickly. As we explored in another recent post, France is now the seventh leading global study destination, after the US, UK, Australia, Canada, China, and Germany. This also places France as the third-ranked destination in Europe, and the second among non-English-speaking host countries. The most recent mobility figures, released earlier this year by Campus France, reveal that the number of international students in France grew to 323,933 in the 2016/17 academic year. This amounts to year-over-year growth of 4.6% – the country’s fastest rate of growth in five years – and an overall increase of 12.2% in total foreign enrolment since 2011/12. The two charts that follow tell the story of this growth dynamic. In the first, we see the growth in international enrolment in France since 2005 weighed against global growth in student mobility. In the second, we see the share of internationally mobile students hosted by France, again since 2005, in the context of that global growth. 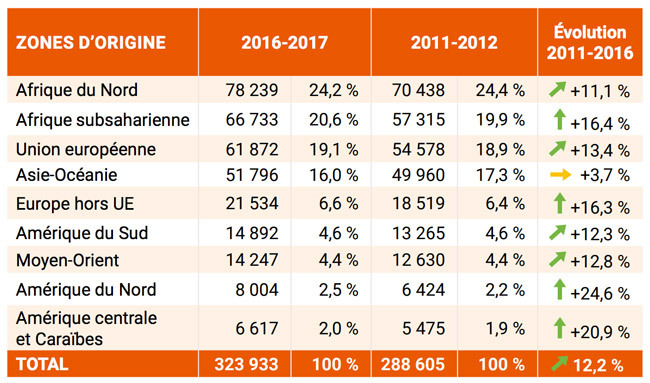 As the following table illustrates, Africa remains the primary source of foreign students for France, and accounted for nearly half (44.8%) of all visiting students in 2016/17. Students from the European Union (19%) and Asia (16%) combine for another 35% of total enrolment. In terms of absolute numbers, those three regions have also driven most of the growth for France since the early part of this decade. Among sending countries, Morocco, Algeria, Tunisia, and Senegal account for the bulk of African enrolment for France – the first two of these have demonstrated consistent (and strong) growth since 2011/12 whereas both Tunisia and Senegal have declined marginally over the last five years. European growth, meanwhile, has been buoyed by a number of markets, including Italy (+54% since 2011/12), Spain (+30%), and Portugal (+39%). The United States, which ranked as the 12th leading sender for France in 2016/17, has also shown strong overall growth of 32% over the last five years. Some of the slower growth of the past several years can be traced to the so-called “Circular Guéant” – a widely criticised policy statement from May 2011. The circular introduced new restrictions on post-study immigration that prevented some non-EU students from staying and working in France after graduation. It was repealed in 2012, but the perception of France as a less welcoming destination for students outside the EU appears to have lingered on. This effect has been reversed to some extent by the global popularity of French President Emmanuel Macron, who came to office in May 2017, and by his strong statements on the need for France to become a more welcoming and ambitious study destination. This entry was posted in Europe, France, Regions and tagged undergraduate student recruitment, education abroad, study abroad, colleges with international students, universities with international students.